I know, I know. I usually post hamburger photos and recipes here. But I just have to mix it up a bit for this incredible hot dog that we’ve been eating for the past few years. It all began one day at a Seahawks game in Seattle. I was hungry and saw something on the menu called a “Dangeruss Dog.” (“Dangeruss” is Russell Wilson’s nickname.) I wasn’t sure what all was on it, but the photo up on the menu board had a hot dog, mac-and-cheese and Seahawks-colored tortilla chips. For some unknown reason, they stopped serving the Dangeruss Dog at Seahawks games a year or two later, but we never stopped making them here at home. And they’re fantastic. 1) Grill the hot dog. 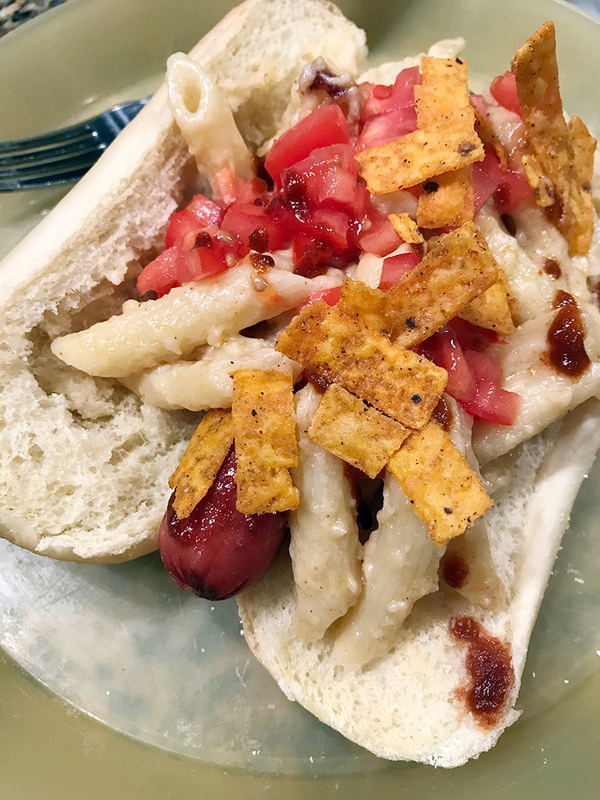 3) Put a healthy amount of mac-and-cheese on top of the hot dog. We’re partial to Beecher’s Mac-and-Cheese, which is the best we’ve ever had … but it’s not distributed widely. This hot dog works just fine with any mac-and-cheese, even Stouffer’s frozen. 4) Put some sriracha sauce on top of the mac-and-cheese. 5) Diced, fresh tomatoes on top next. 6) Tortilla chips/strips on top next. We buy mini tortilla strips that are made by the Texas Toast people, and they work great. We’ve also just crushed some Doritos and sprinkled them on top, and that also works great. You’re done! Thank me later (or in the comments below). This is the best hot dog you’ll ever have. Oh, have a fork handy because you’re gonna need it to finish whatever falls out of the bun.